Darlene’s favourite place is on stage motivating people to go after their dreams and live the highest version of their life! On stage she shares powerful, inspirational, educational and empowering story-based content gleaned from her life and her clients’ lives to show audience members that anything is possible, regardless of circumstances. 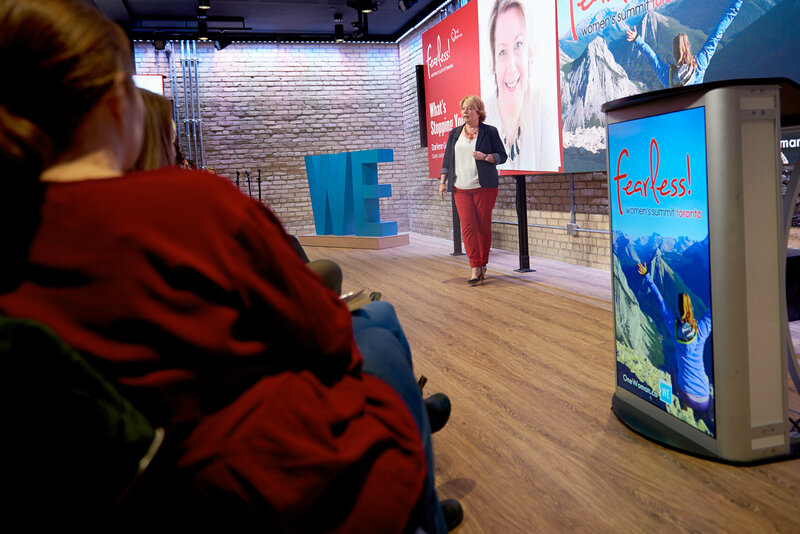 Her presentations are innovative, interactive, and engaging and can be customized for your audience’s needs. From workshop to keynote, Darlene’s fast-paced, fun, and interactive style will have your audience leaving feeling motivated and armed with an action plan so they can create the life and business of their dreams. • What is Stopping You? The five key ways to conquer fear and circumstances to live the life of your dreams. • “Why?” The Most Important Question to Answer Your “why” is the genesis of your passion and purpose and when you can articulate it to your audience, they will connect on an emotional level and want to hire you. During this presentation you will learn how to identify your unique “why” and present it to the world. • Leverage the Power of Story to Connect, Motivate, and Inspire Story-based marketing is the most effective way to connect and engage with your best clients to boost your business by raising trust and credibility, as well as differentiating yourself from the competition. In this interactive presentation, your audience members will uncover stories that they can use in their marketing to sell. You can contact Darlene to speak at your event by email at darlene@darlenebutts.com or phone at 416-722-9766! “I am so glad that I stuck around til the end of the day as your presentation really hit home.” Bonnie G.
“I wanted to tell you how much I loved your presentation on Saturday afternoon. For me it was exactly what I needed to hear!” Melissa S.
“I would like to say again I though your talk was fantastic….loved the challenge also!” Cathy L.
“Loved your presentation yesterday — amazing!” Dawn M.
“Everyone probably had their own speaker who was their “one”. The one who seemed to speak directly to them. You were my “one”. ……thank you!” Julie M.
“You where so inspirational. I loved how you challenged us to just take the next step!” Tammy P.
“You are a wonderful speaker and enjoyed your talk Saturday!” Sandra Z.